Who here hasn't heard of the television show Orange is the New Black? That's what I thought! The show has EXPLODED, and my unhealthy devoted addiction started. I absolutely love the show. Orange is the New Black isn't a book I would normally read, but since I have to read anything that is based on a movie and/or T.V. show, I just had to read it! To say I loved it would be a tad bit of an understatement. I devoured this novel in one sitting! I simply couldn't even fathom the idea of putting it down. Yes, it is different from the T.V. show. No shocker there! However, I love the entertainment value I get from vegging on the couch with red wine and popcorn while I waste spend valuable hours on binge watching the show. And I loved the real peak inside Prison I got with the book. It made me laugh, it almost made me cry. There are light moments, and then there are harder moments. If you love Yoga Janet in the show, you'll love her even more in the book! Vibrant women from all walks of life! You will find a place for each person in your heart. 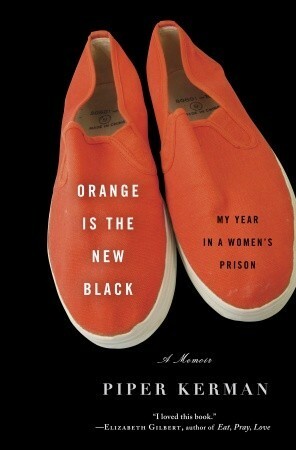 Orange is the New Black should not only belong on your Netflix, but it should have a spot on your bookshelf, too! I've seen a lot about the TV show so I'm curious about this book. If I were to watch it, I'd definitely want to read it first just so the differences. Lovely review Cathy! You share lovable reviews about this book. I wish to read it as much as possible for me..your points really attracted me ..Thanks for sharing...I absolutely love the show. Orange is the New Black isn't a book I would normally read, but since I have to read anything that is based on a movie and/or T.V. show, I just had to read it!